The partner of a friend of mine texted said friend while were were sitting above Bondi’s iconic outdoor pool to report that he’d just seen the Bondi Vet eat some lunch. The Bondi Vet is, of course, Dr Chris Brown, and this snippet of information did indeed please me so. Not because I was separated by two degrees from this rather eye-pleasing human specimen. No, because clearly the Bondi Vet is actually a vet who lives in Bondi. And LOOK. 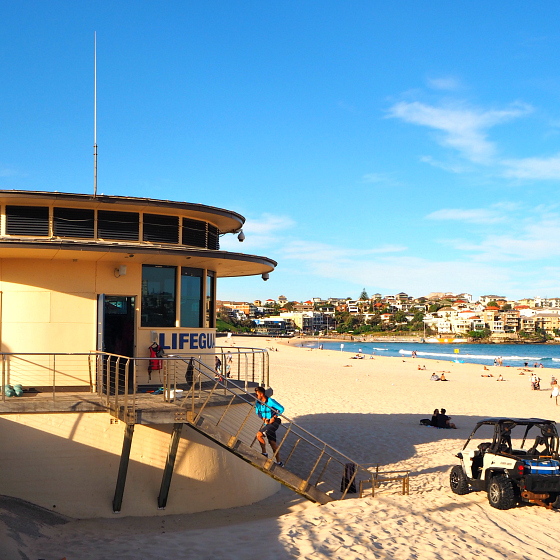 The Bondi Rescue lifeguard tower is not a figment of a Baywatch-esque fictitious situation. There is no doubt about it – both of these shows have helped to further put Bondi Beach on the world map but it’s not difficult to see why this iconic Australian spot has become such a drawcard for local, national and international tourists. Until last week, I’d only visited Bondi twice – both fleeting. I hadn’t been seduced by its magic. Now, I’m pleased to report that Bondi has captured this girl’s soul as the ultimate city/surf destination. I barely scratched the surface of Bondi’s charms on our two night stay (*we were hosted by Destination NSW) but I know I’ll be back with the surfers in our family in tow. My hot tip: don’t try and do other parts of Sydney if you’re heading for a short escape. 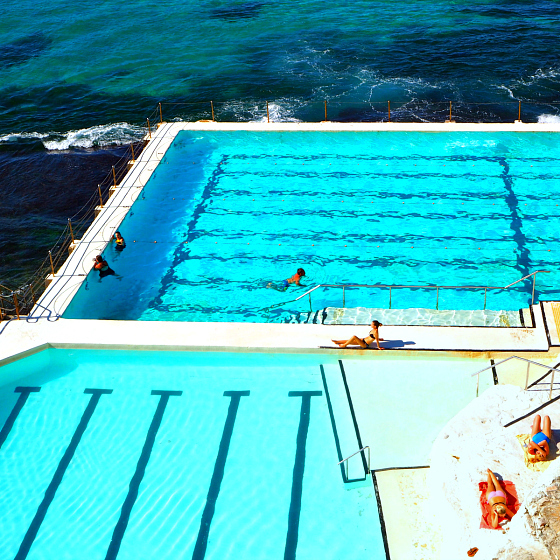 Base yourself in Bondi and soak it all in. 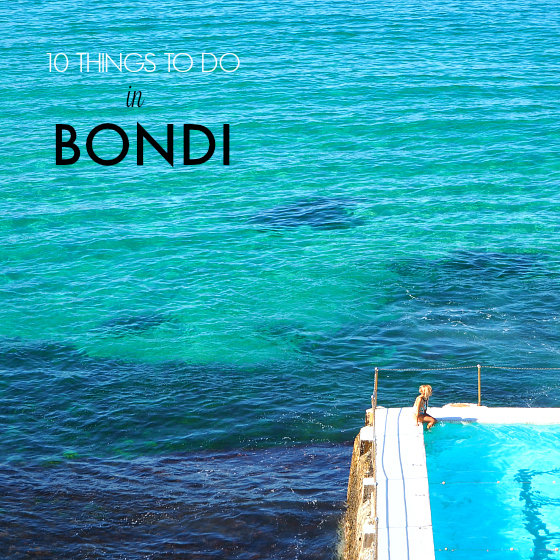 The below list of 10 things to do in Bondi will get you started. 1. 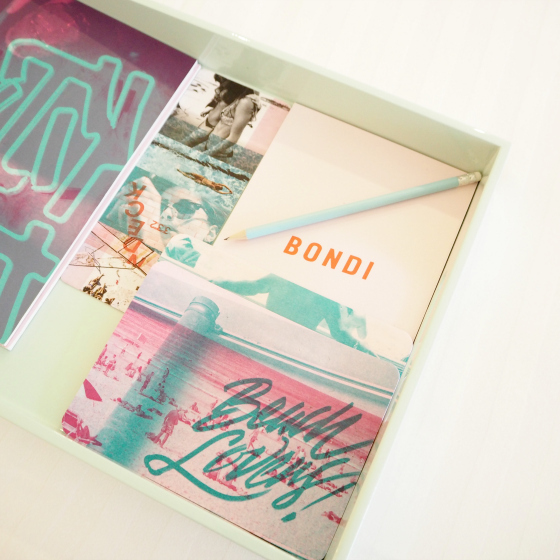 Stay at QT Bondi. Show me a QT Hotel in any Australian city or regional area and I’ll book it. STAT. 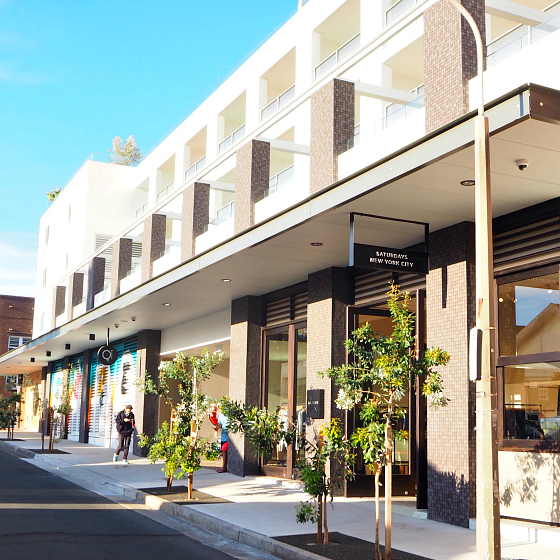 QT Bondi is the latest to be rolled out by this clever hotel chain. 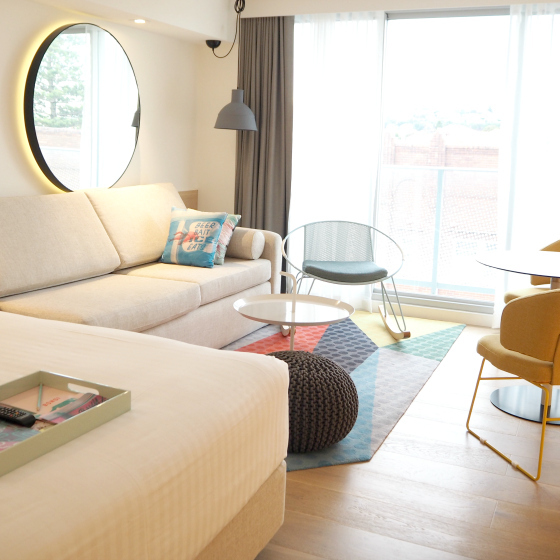 I say clever as this accommodation brand breathes local personality into each of its hotels. QT Bondi has a beach theme not unlike its cousin at Surfers Paradise on the Gold Coast. 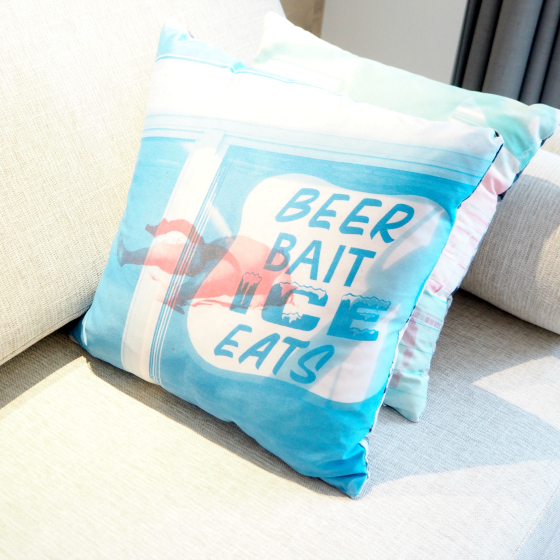 From the cushions, to the beach thongs hanging in crocheted bags on the wall, to the soft, coastal colours of the interior, staying at the QT Bondi puts you in the Bondi frame of mind from the get go. And the bed? The all important bed? Slumber heaven – also a trademark of all QT hotels. 2. Swim at the Bondi Baths. I’m doing this when I come back. I had to content myself with watching locals churning the laps on the second day of our stay (the first day the pool was closed and being filled) from our birds-eye conference-room view. Sydney in autumn was turning it on like summer and no-one was wasting a moment of it. 3. Dine at Icebergs. I always thought that the only dining option above the Bondi Baths was the fine dining restaurant, Icebergs, but I was excited to find out that there is a surf club/bistro option as well. I say, why not try both? Apparently Icebergs is the go for Sunday brunch in the restaurant. It’s now on my list. 4. 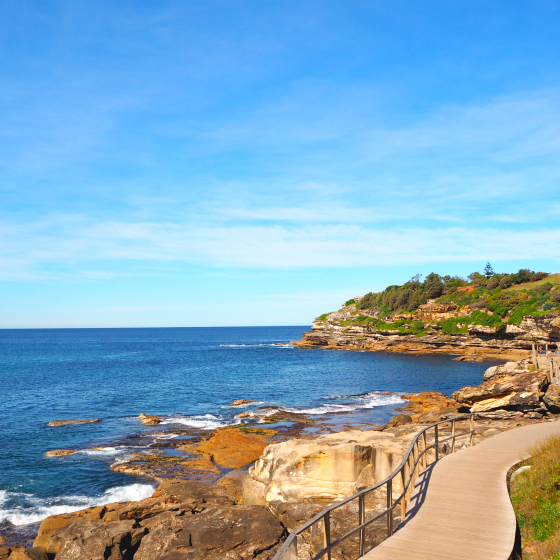 Walk the Bondi-Bronte track. The coastline between the beaches in Sydney’s Eastern suburbs is dramatic and visually stunning. The activewear game of those who walk the track is strong. Don’t let the ripped midriffs put you off a photo opportunity. 5. Do a yoga class. I may not look like a yogi but yoga is one of my favourite ways to exercise. Try Power Living Yoga if you like your yoga on the warm side. Want to tap into the sounds of the sea? Yoga by the Sea may be more your style. 6. Surf Bondi Beach. I didn’t witness a time of the day that the water was devoid of surfers – and we were there at an off-peak/mid-week time. If you want to get to know the beach better – in a safe way – sign up for a tour and a lesson from the team at Let’s Go Surfing. You get to spend time with a local lifesaver … who knows? It could be a famous one. 7. Dine out at Bills. Bills restaurants are now found everywhere from London to Tokyo but the vibe in each is the same as the original in Sydney’s Darlinghurst. Bondi and Bills do go together with that relaxed beach lifestyle. 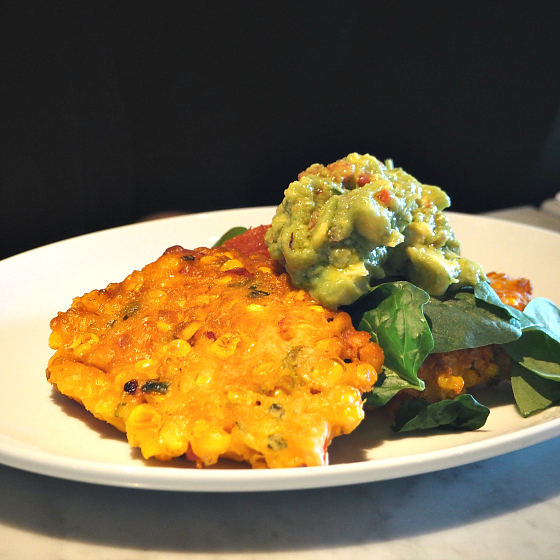 The sweet corn fritters are a breakfast must. 8. Dine out at Trio Cafe Bondi Beach. I loved breakfast here – the Middle Eastern/Mediterranean influence on the menu reminded me of one of my faves in Brisbane (Shouk). 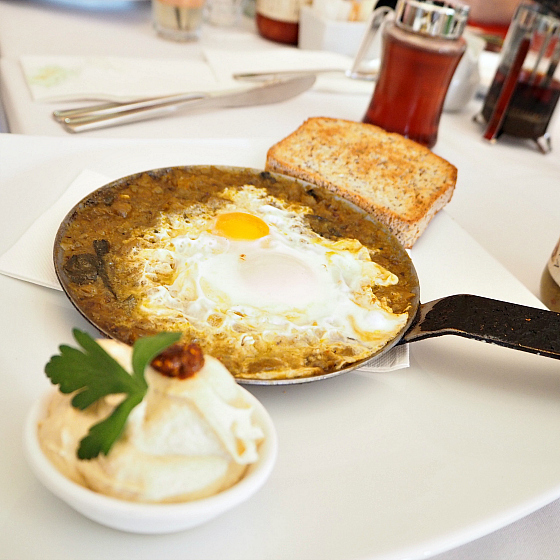 If you don’t order the shakshouka or green shakshouka you’ll have menu envy. 9. Shop in quirky boutiques. A big reason why I need to go back is that I only scratched the surface when it came to window shopping and browsing the streets just back from the beach at Bondi.Gould Street is your street to wander in and out of on-trend boutiques and chain stores. I was very excited to have found that Saturdays Surf NYC had taken up home for the first time in Australia in Bondi. We stumbled across this upmarket New York surf shop in Soho in 2012 … drawn in also by its barista coffee offering (a rare thing in the US). Do visit Aquabumps, a gallery featuring sunrise prints taken by photographer and surfer Eugene Tan. 10. Visit the Bondi Markets. Shop up and coming designers, jewellery, vintage and retro-chic homewares. Sometimes charity stores sell at the markets and this is where you’ll find some true gems. If you’re considering a Sydney escape with a difference – and you love the beach – then put Bondi on your list. You won’t be disappointed. Are you a local? Been lately? What else shouldn’t we miss on a short escape to Bondi Beach? * I was a guest of Destination NSW for our trip to Bondi Beach as part of my agency, The Remarkables Group’s annual conference. I think Bondi is really nice and interesting place . thank you for sharing this useful and interesting post with us. I think Bondi really nice and interesting place . thank you for sharing this useful and interesting post with us. Have just returned from a sneaky lunch time break for a walk and swim at Bondi (so happy to be a local) and am pleased to report that it is again looking stunning. And we think there may have even been some whale action last week. We love a drink at the club next to Icebergs where, with lucky timing, you can snag a table on the verandah and enjoy that iconic view at a fraction of the price. And one of my all time fav restaurants is Sefa Kitchen – an incredible Turkish eatery with the most amazing food (Bondi Road, back up the hill from the beach). And pick up a coffee from Speedo’s at North Bondi, grab a piece of grass on the headland and be blown away by the views back down over the beach. Thanks so much Leanne … and yes, you’re very lucky to be local! I mentioned the club above as as a non-local, I didn’t realise there was anything but the fine dining restaurant there. So good! Dinner at Brown Sugar. Delicious food, great wine list, friendly staff. It so is – we were too far from Westfield Bondi Junction for a visit – thankfully, my credit card says! Bondi Trattoria, on Campbell Pde opposite the little road that goes down to Icebergs – consistently good, lovely food. Sababa – up Hall St – if you want a plate of Israeli food that’s almost impossible to finish, cos there’s so much (falafel, shawarma, hummus, pickles, salad, pita – nom!). And The Speakeasy – tiny hole in the wall wine bar with delectable share plates on Curlewis St. Yes, I’m a local. We lived within walking distance of Bondi for years, and it’s my Kiwi partner’s ‘home’ beach in Oz. Oh Karen, these suggestions are gold. Thanks so much. Sababa sounds amazing! 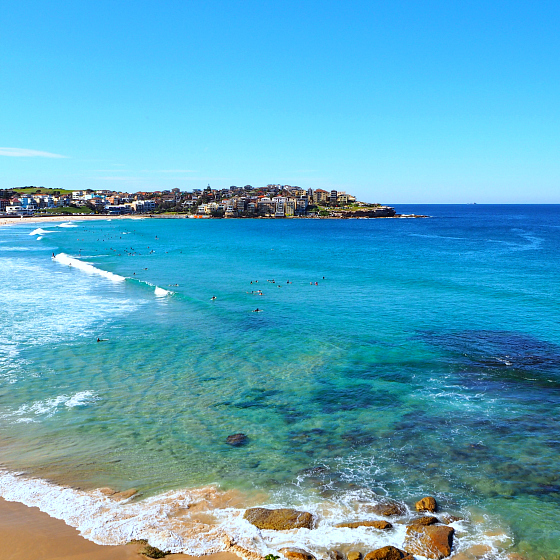 I think I will organise a long weekend away soon for some sightseeing, shopping, walking and dining at Bondi. How fabulous, haven’t been to Bondi in ages. I will allow a day to lunch outside the MCA … view never fails to make me gasp at Sydney’s harbour beauty. How awesome was it?! I’d only been to Bondi once before and it was so great – like you said – to base ourselves there and really soak it all in. I’ll definitely be going back!